• 15 strawberries. Leave 6 for decoration and dice the rest. Pre-heat the oven to 180°-190° (355°F-375°F). Prepare one 22x22cm baking pan by covering the bottom with a baking sheet. Put ingredients (A) into a small pot and heat under low heat until all the sugar melts. Then pour this mixture into a bowl. Sift ingredients (B) and add them to the sugar mixture. Blend with an eggbeater until mix well. Whip the whipping cream and the sugar until fluffy. Keep a portion for decorating the top of the cake and mix the rest with the diced strawberries. 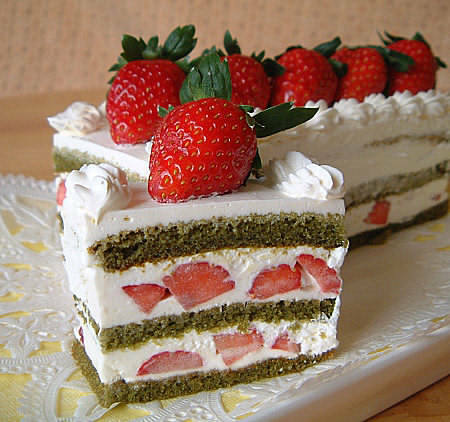 Spread the strawberry whipped cream mixture on the cake layers as fillings in the middle. Decorate the top of the cake with the other portion of whipped cream and 6 strawberries.